Per the Federal Digital Government Strategy, the Department of Homeland Security Metrics Plan, and the Open FEMA Initiative, FEMA is providing the following web metrics with regards to it's primary websites. 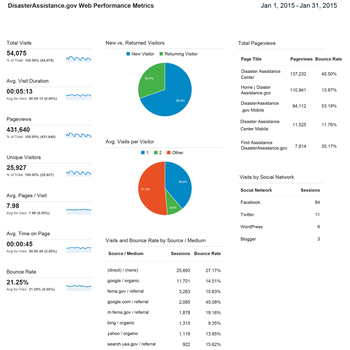 Per the Federal Digital Government Strategy, the Department of Homeland Security Metrics Plan, and the Open FEMA Initiative, FEMA is providing the following Web performance metrics with regards to DisasterAssistance.gov. Per the Federal Digital Government Strategy, the Department of Homeland Security Metrics Plan, and the Open FEMA Initiative, FEMA is providing the following search performance metrics with regards to FEMA.gov. Per the Federal Digital Government Strategy, the Department of Homeland Security Metrics Plan, and the Open FEMA Initiative, FEMA is providing the following Web performance metrics with regards to Floodsmart.gov. Per the Federal Digital Government Strategy, the Department of Homeland Security Metrics Plan, and the Open FEMA Initiative, FEMA is providing the following search performance metrics with regards to Ready.gov. Customer satisfaction survey results for careers.FEMA.gov for 2015. Per the Federal Digital Government Strategy, the Department of Homeland Security Metrics Plan, and the Open FEMA Initiative, FEMA is providing the following Web performance metrics with regards to FEMA.gov. Per the Federal Digital Government Strategy, the Department of Homeland Security Metrics Plan, and the Open FEMA Initiative, FEMA is providing the following web performance metrics with regards to Ready.gov. Customer satisfaction survey results from FEMA.gov for 2015. Customer satisfaction survey results from Ready.gov for 2015. Per the Federal Digital Government Strategy, the Department of Homeland Security Metrics Plan, and the Open FEMA Initiative, FEMA is providing the following performance metrics with regards to FEMA.gov.